Brass is a metal alloy that is always made with a combination of copper and zinc. By varying the amount of copper and zinc, brass can be made harder or softer. 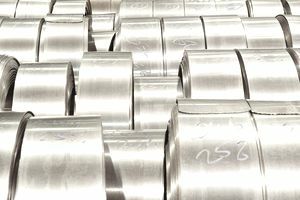 Other metals — such as aluminum, lead, and arsenic — may be used as alloying agents to improve machinability and corrosion resistance. Brass is usually a warm golden color. The addition of 1 percent manganese, however, will turn brass to a warm chocolate-brown color, while nickel will make it silver. Lead often is added to brass to make it softer and thus more malleable. Arsenic may be added to make brass more stable in certain environments. Tin can help to make brass stronger and harder. Red brass, not surprisingly, is warmer in color than other brasses. It also is a particularly strong type of brass. Cartridge brass (also referred to as 260 brass and yellow brass) is best known as an ideal metal for shell casings. It is most often sold in sheet form and easily formed and worked into desired shapes. 330 brass is particularly useful in tubing and poles because it is both workable and machinable. Fire poles are a common use for 330 brass. Free machining brass, also called 360 brass, is relatively high in lead, making it easy to cut and shape. It often is used to make items such as rods and bars. Naval brass, also called 464 brass, is highly resistant to corrosion and thus ideal for use in seawater. Contact with amine, a compound derived from ammonia, is a common cause of brass corrosion. The alloy also is susceptible to corrosion through the process of dezincification. The more zinc brass contains, the more it can be impacted by zinc leaching out of the alloy, causing it to become weaker and more porous. The National Sanitation Foundation International (NSF) standards require brass fittings containing at least 15 percent zinc to be resistant to dezincification. Adding elements such as tin, arsenic, phosphorous, and antimony can help achieve this effect, as can reducing the amount of zinc to less than 15 percent. Brass with less than 15 percent zinc is known as red brass. Naval brass, which is used in seawater, actually has 40 percent zinc, but it also contains 1 percent tin to reduce dezincification and make it more resistant to corrosion. Brass is a popular metal for applications that are both practical and decorative. Items like door handles, lamps, and ceiling fixtures like lights and fans are examples of practical uses that also serve a decorative purpose. Aside from being attractive, brass also is resistant to bacteria, making it that much more useful for fixtures like door handles that multiple people touch frequently. Some uses, such as figures atop bed posts, are strictly decorative. Many musical instruments also are made of brass because it is a very workable metal and can be formed into the sorts of precise shapes necessary for horns, trumpets, trombones, and tubas. These instruments, collectively, are commonly known as the brass section of an orchestra. Because of its low friction and resistance to corrosion, brass also is popular hardware for plumbing fixtures and other building supplies. Pipe fittings, nuts, and bolts are often made of brass to take advantage of its characteristics. Shell casings for ammunition also are a popular use for brass, largely because of its low friction. Brass also is highly ductile, meaning it can be formed into a lot of shapes, making it a popular alloy for use in precision instruments, such as gauges and clocks.